tube overdriven amp sounds ranging from sparkling clean to moderate crunch to overdriven sounds. This pedal is extremely open sounding with high transparency and wide dynamics. The "Jewel Drive" reacts extraordinary touch sensitive, the differences between softer and harder picking are reproduced in every nuances. Due to it´s novel and unique analog circuit, the "Jewel Drive" creates a rich, complex and beautiful singing overtone texture, while the inherent tone of your amp and guitar you are playing is perfectly preserved. Used as on overdrive in front of your amp the "Jewel Drive" gives you the feeling of a cranked amp even at lower volume levels. Clean notes now have a wider dynamic range and more overdriven sounds are still pronaunced and rich with the right content of even-order harmonics. By simply turning the guitar´s volume knob you can blend through the complete overdrive spectrum, the "Jewel Drive" interacts very, very well, very similar to a good tube amp! Basically you have the common overdrive controls to adjust your tone: Drive, Treble and Volume. But there is an additional "Timbre" control which makes this pedal again unique. Turning this knob influences some dedicated electronic parameters inside the pedal at the same time. The midrange spectrum, the overtone structure, the dynamic and frequency response can be adjusted to perfectly suit your personal tone! And this is realized by only ONE "Timbre" control and not many confusing switches and knobs. And the greatest thing is that you have an additional foot-switchable and adjustable Gain AND Volume Boost, e.g. for solo work, which makes this pedal so versatile. Thanks to its extremely large signal-to-noise ratio the Vahlbruch "Jewel Drive" shows very low background noise and is therefore suited for any studio work and professional live performance. The pedal has a true bypass switch for perfect signal transfer without any tone loss. A blue LED shows you the on/off status. You can use a 9V battery to power the pedal or an external standard 9V power supply (ring +, tip -). The power consumption is approximately 20mA. The "Jewel Drive" pedal has NO pcb-mounted jacks, NO pcb-mounted footswitch and NO pcb-mounted pots! This certainly means more effort building the pedal compared to industrial mass production but it´s truly worth it! 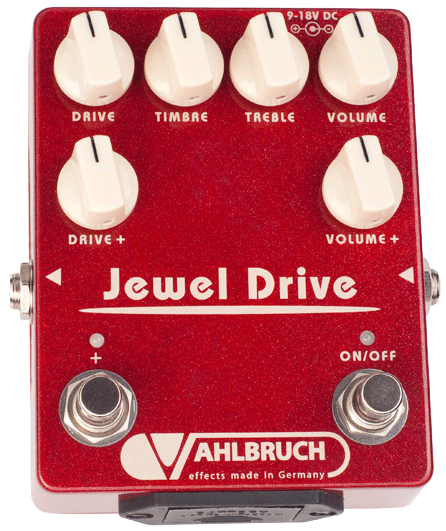 Like all Vahlbruch pedals the "Jewel Drive" is hand-made utilizing only the best components available worldwide for high-end tone and years of trouble free operation. 100% pure analog - made in Germany.